I have to admit, I was a latecomer to Adobe Lightroom (LR) because I jumped on the Apple Aperture boat only to have it sink on me years later. In the beginning I actually signed up to be a Lightroom beta tester but was busy with my marine biology career and didn’t really dig down into it. When the time came for me to pick a program for my digital asset management (DAM) I went with Aperture for various reasons. The 2 programs seemed to follow similar development advances and Aperture played nice with all my other applications till Apple basically turned their backs on the professional users to cater more to the consumer market. So like many people I was in the market for a new solution and so LR was the obvious choice. I do like LR’s adjustment capabilities and it mostly plays well with Photoshop, although I’ve never understood why I can’t use a PSD for a watermark the way I could with Aperture. But as far as a DAM I am totally frustrated with it for many reasons that I’m not going to bore you with. So I’ve been in the market for something new and was going to look into making the move to Capture One Pro but then Luminar was announced. I already have many of the Macphun products and the price was a lot easier to swallow. I realize that it doesn’t have a DAM yet but they say it is in coming. So hopefully I haven’t bored any readers with all of that back story but my background in Aperture is one of the reasons I like the set up of Luminar I can even still use my preferred import workflow using Aperture, which is more flexible and faster than LR, and then move into Luminar. One of the first Aperture-esque features is the customizable workspace. You can customize what adjustment panels or filters as they call them, are available to you and create multiple workspaces for different types of images. Of course they have already created some for you to start with for landscape, portrait, street, B&W and a general default. I also think the flexibility of Luminar to be able to appeal to many levels of users and to allow users to grow with it is going to be a great strength moving forward. You can quickly apply a preset and share it out to Facebook, Twitter or even Apple Mail, something I sorely missed with LR, or take full control with many features similarly found in Photoshop including layers, luminosity masks and blending modes. Additionally it can be used as a plugin or stand-alone program. If you want to speed up your workflow learn the keyboard shortcuts. You can find them by mousing over the icon or in the manual but admittedly I’m probably one of the few that has read it and I found the format was not helping me so I made my own list which you can download here as a PDF. It is a work in progress so let me know if I messed up something. User hint: If you want to use the RAW capability of Luminar then open images directly from the open command in Luminar or if you are in LR you can go to File/Plug-in Extras/transfer to Luminar. 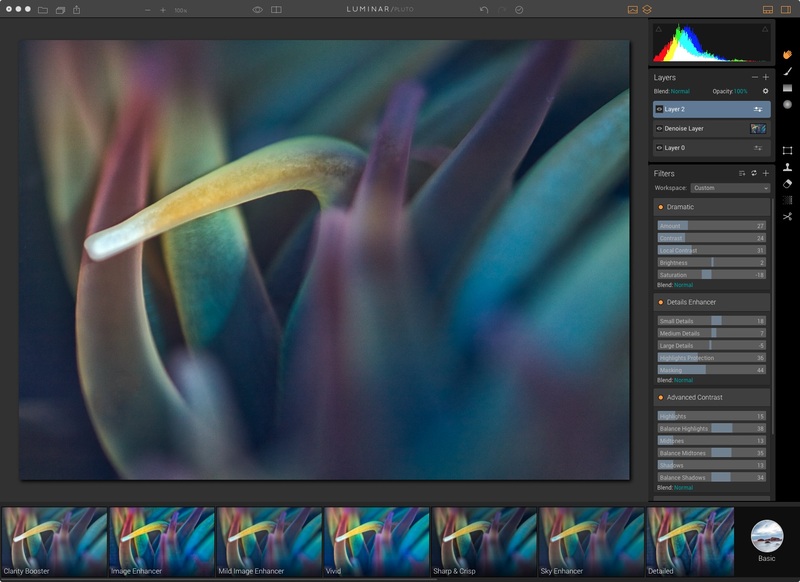 My biggest wish for the next Luminar update: To get the library module available and to have it more flexible than what LR offers for those of us that don’t always want things alphabetical.